Hi friends and happy Wednesday! 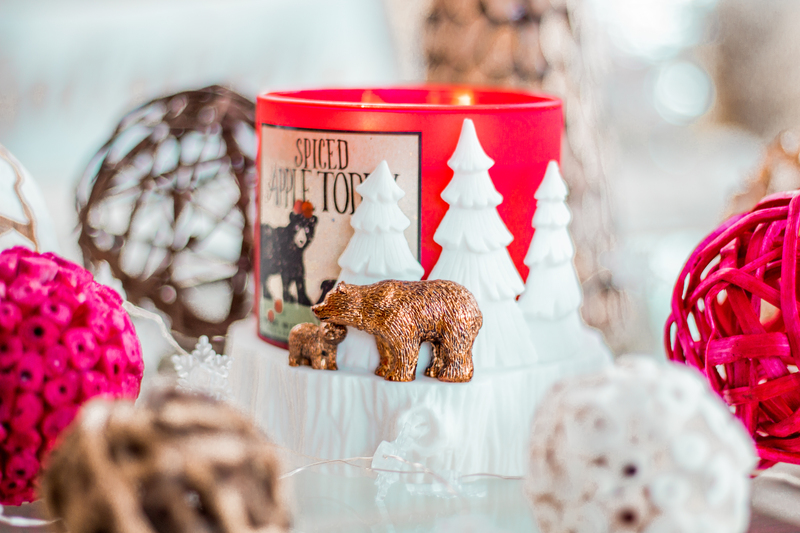 Now that Thanksgiving has come and gone, it’s officially time to dive into all things Christmas! 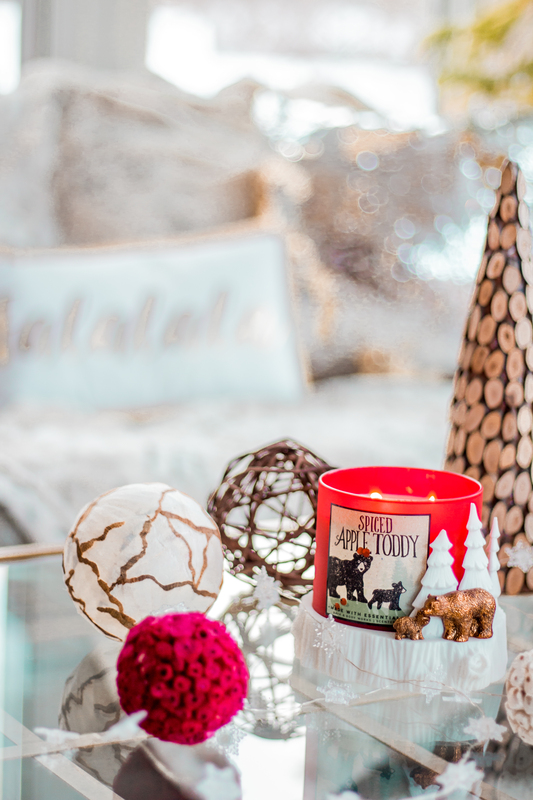 And to help you get a jump start on your shopping, I’ve teamed up with Village Pointe to share gift ideas for every gal! 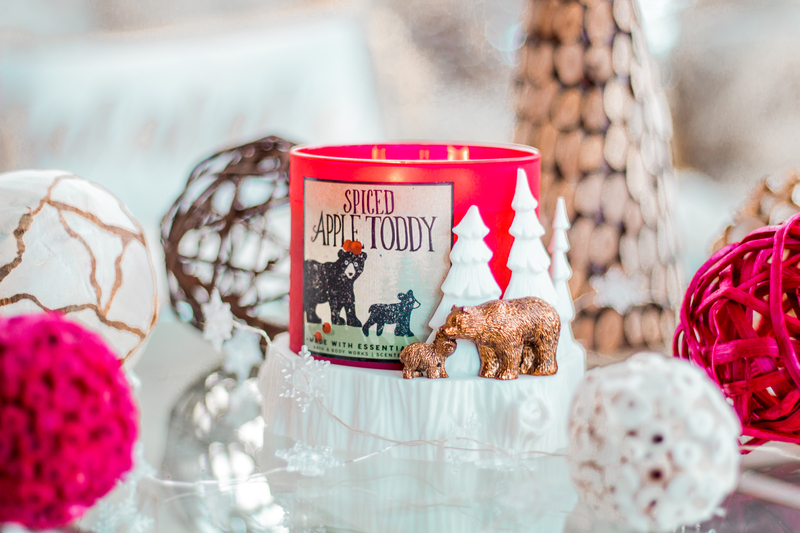 Whether you’re shopping for a Secret Santa, a Hostess, a White Elephant, a Mom or Sister, or for Stocking Stuffers; we’ve got you covered! 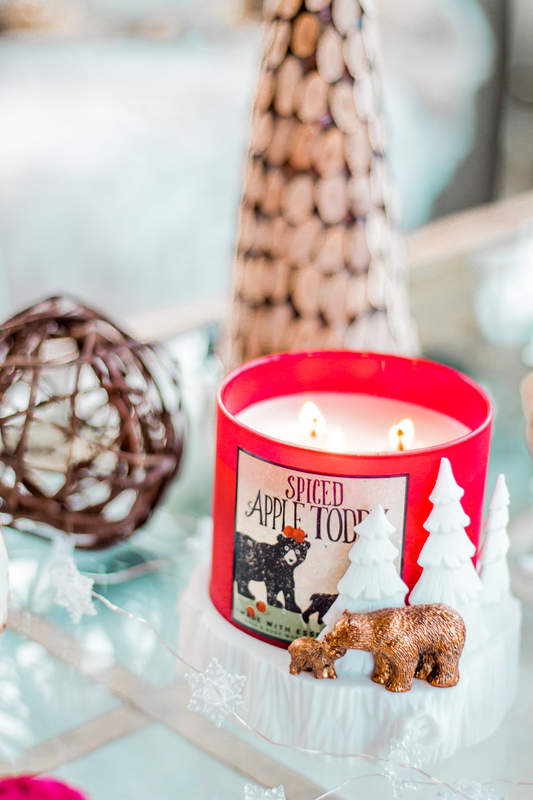 And the best part, all of these gifts individually are under $50! The act of giving should not break the bank! During my time working at a nonprofit, I was blessed to have the best coworkers and one of my favorite memories during Christmas time was our Secret Santa exchange! I think it’s so fun to shop for someone you may not normally shop for, which helps you get to know them even more! 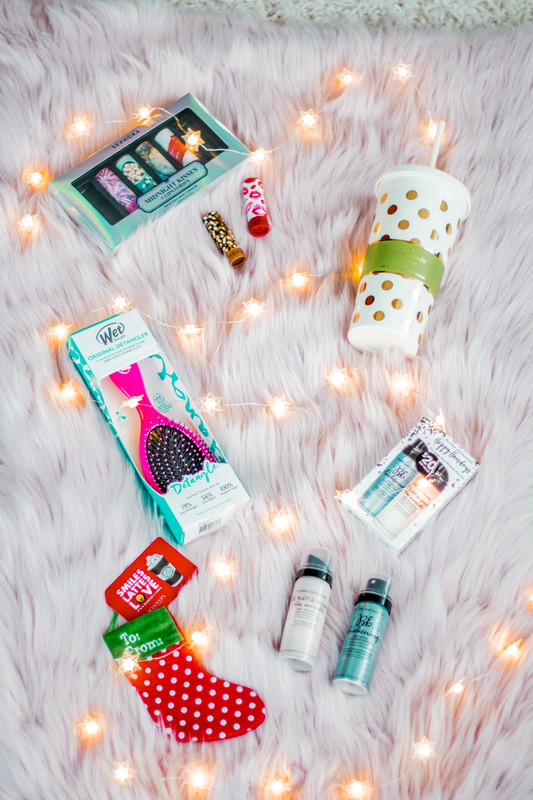 One year I was given a hair care basket and it was honestly one of the best gifts because it was thoughtful and practical! 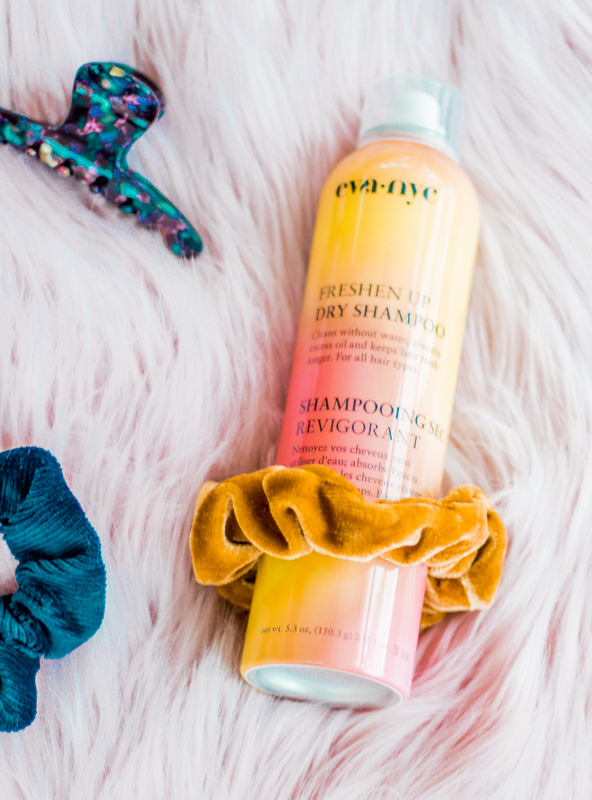 So if you are looking for a Secret Santa gift for your hair obsessed coworker, there’s no better gift than good dry shampoo because it’s the gift that keeps on giving aka fabulous hair for days! 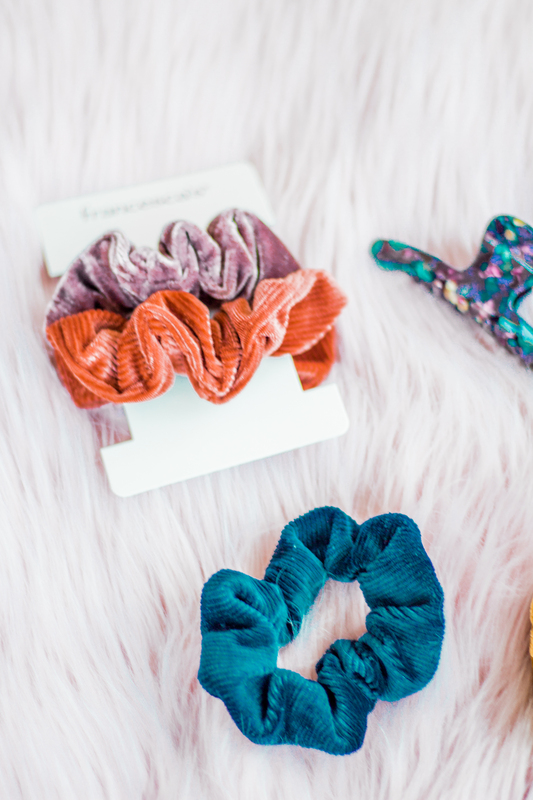 To keep those locks fresh while getting your beauty sleep, a scrunchie is your best friend and a cute hair clip makes the task of curling your hair a little less dreadful haha. 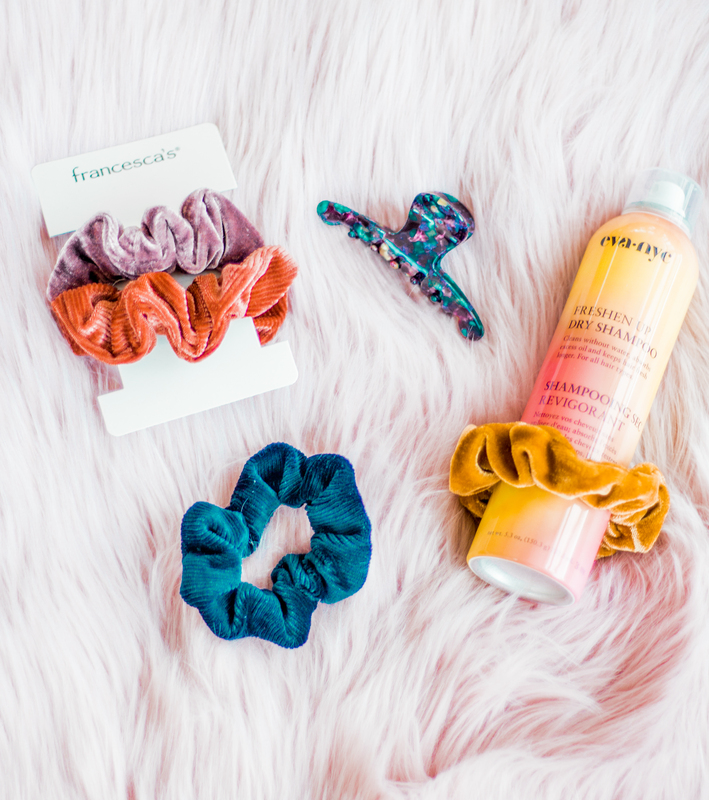 Francesca’s has the cutest little selection of hair accessories, as well as great hair care products. This dry shampoo happens to be my favorite and I also love their hair mask; it works wonders! I love to give my mom and sis cozy gifts to help make Winter a little more bearable, so every year I get them some kind of robe, pajama set, or new slippers! But after feeling how buttery soft this snowflake top and pant number was, I had to get one for myself, too! Holy moly friends, if you haven’t tried Soma’s pajamas, you are seriously missing out. It was my first time shopping there and I became an instant fan! Unlike the chaos and messiness of other big box pajama/lingerie stores, my Soma experience was calm and enjoyable! The staff were incredibly helpful and friendly, and to my surprise, when I asked to see if they had my size in the back, they actually had it! I feel like that never happens – anyone else? I love to splurge on my girlfriends but for myself, I will wear the same old ratty t-shirts and sweats year after year. And you should have seen the state of my old slippers haha. But this year I decided to give my pajama lineup a refresh and am obsessed with my new snowflake set and white pom pom slippers from Soma! I may be 33 but my mom still fills my sister and I’s stockings and it’s a tradition we look forward to so much! Even the smallest, silliest gifts are so special and it’s so fun to be surprised with what she found! 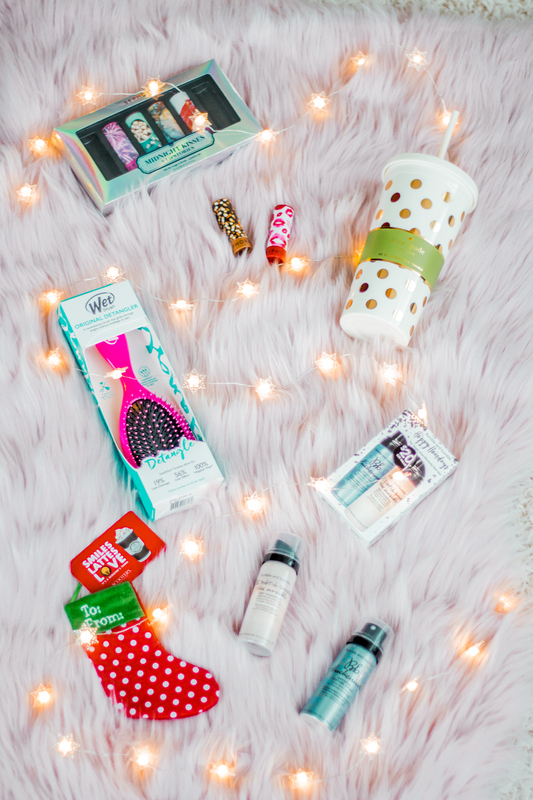 The most reoccurring gifts include lipstick, eyeshadow palettes, fuzzy socks, perfume, gum, travel size hair products, and a tumbler – because she is always telling us to drink more water! 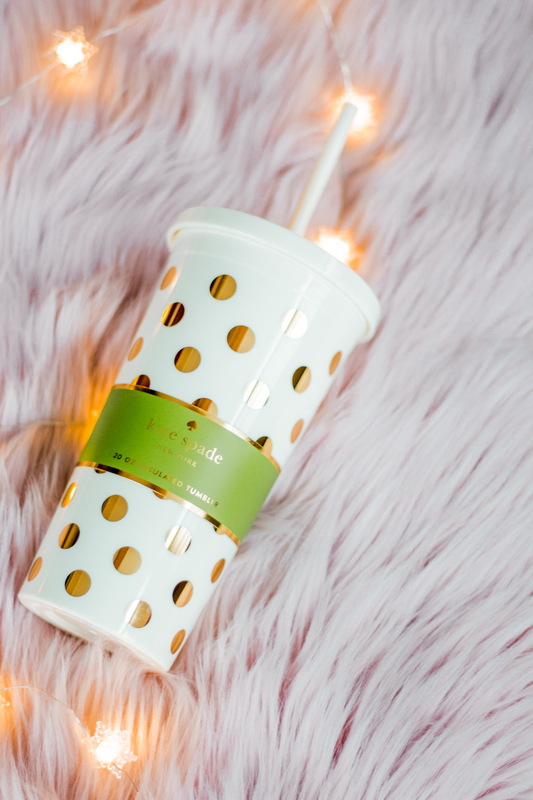 So when I spotted the gold dotted Kate Spade tumbler from Bed, Bath, & Beyond, I knew I had to grab that for my Sister! 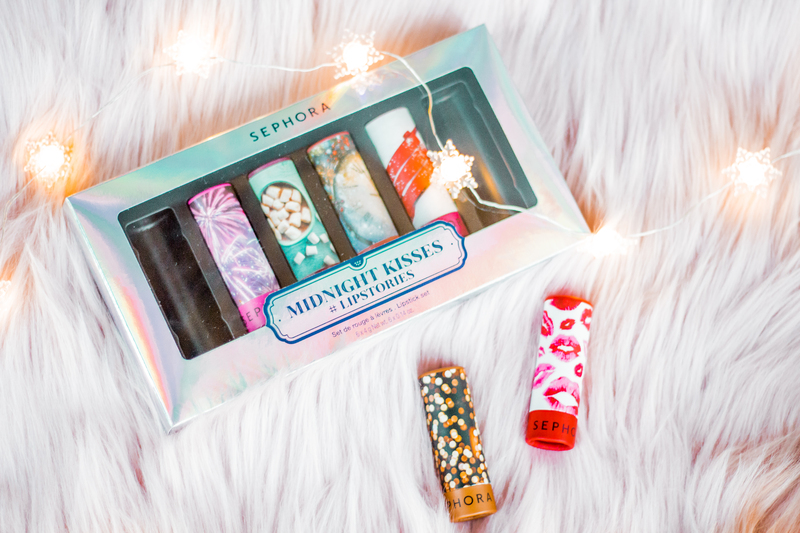 She also loves testing out new lip shades and going daysssss in between hair washes, so the Midnight Kiss lipstick set and Bumble and Bumble travel hair set from Sephora were a no-brainer, especially at the under $20 price-point! 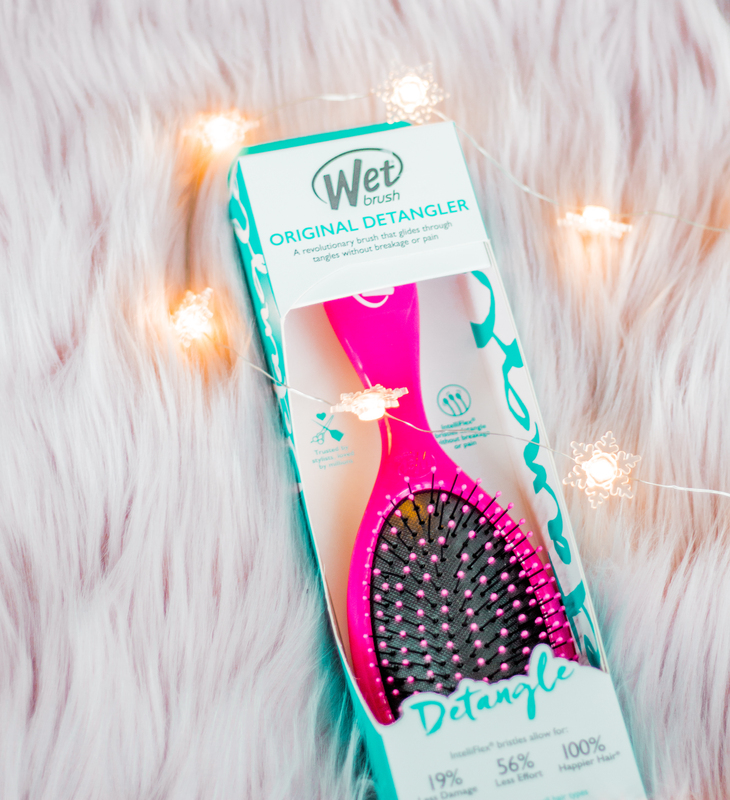 My sister also has an incredible head of hair but is a chore to brush and blow dry, so I thought the Wet Detangler Brush would make her life a little easier. I’ve heard really great reviews about it, so I hope it works well for her! Did you know that Bed, Bath, & Beyond has a huge selection of beauty care products?! It was news to me! And a Scooter’s gift card is a must for every busy Gal, no matter what stage or season of life they may be in! I think a White Elephant gift can be the toughest gift to give because you don’t know whom specifically you are buying for! 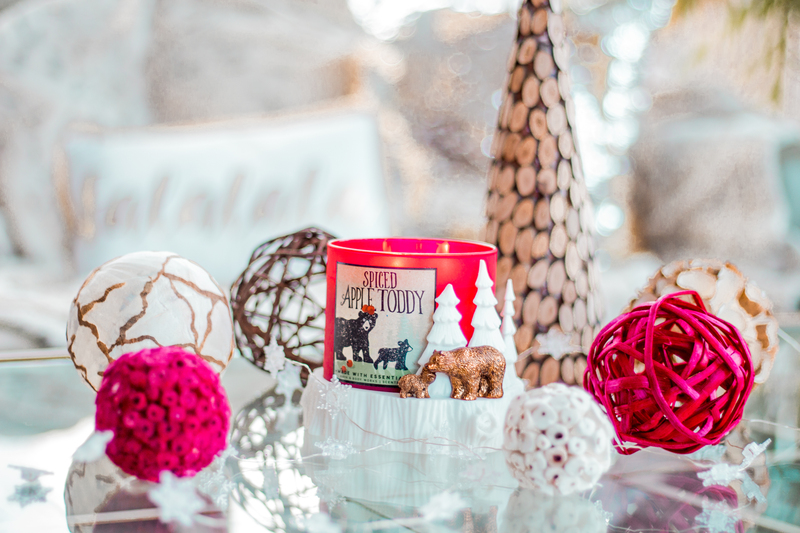 So when in doubt, a delicious smelling candle from Bath & Body Works with the cutest accompanying stand is a safe and smart bet! 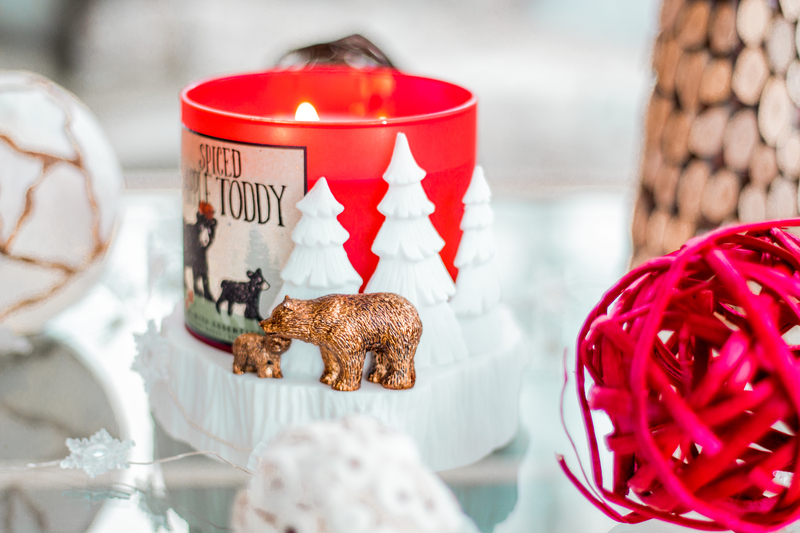 And now that their candles have Essential Oils, I love them even more… which I didn’t think was possible haha. 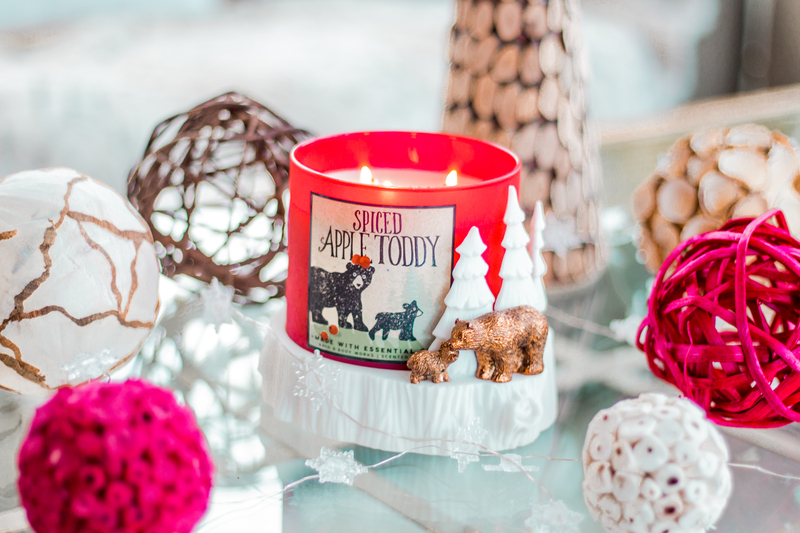 And how stinking cute does this Spiced Apple Toddy label look with the Mama Bear and Baby Cub decorative stand? The perfect match! 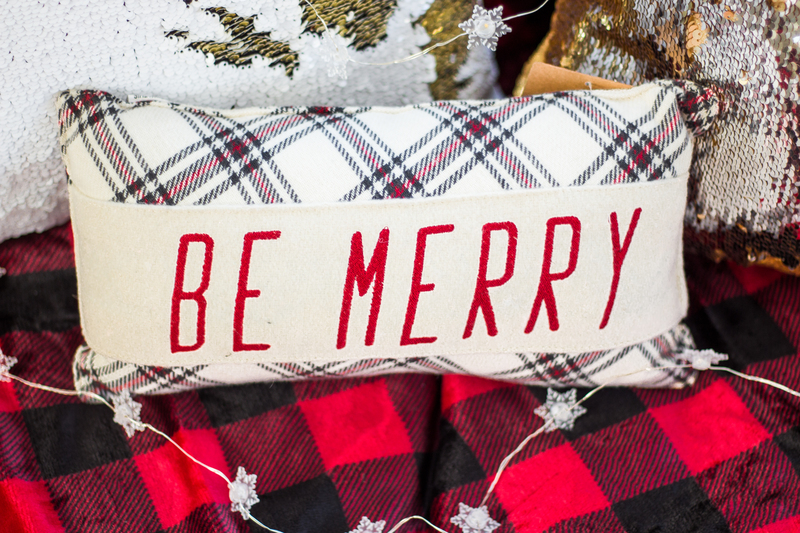 What better gift to give to the Hostess who decks her halls from top to bottom with Christmas decor, than a festive decorative pillow or cozy throw blanket?! 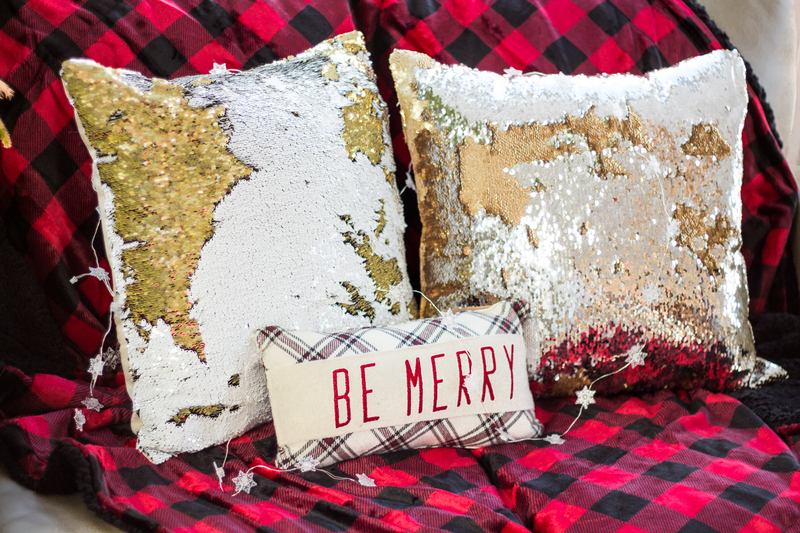 I picked this pillow out with my mom’s friend, Shari, in mind because she truly is the most festive hostess I know! She and her husband throw the best holiday party every year and I look forward to seeing her Christmas village and fancy flocked trees. Even her entryway bench is dressed up to the nines, and I thought this pillow would be the perfect addition to her cozy corner! 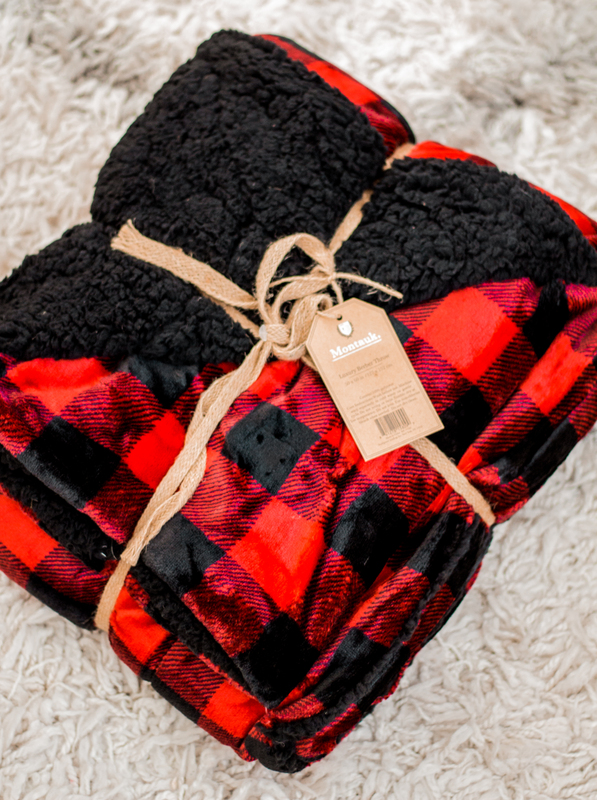 “I have too many blankets” said no one ever haha, which makes a fuzzy festive blanket an ideal gift for just about anyone! 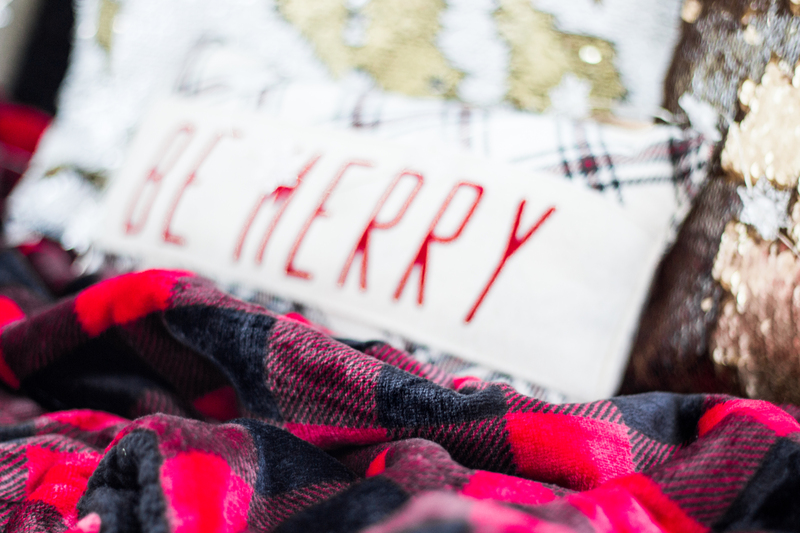 I bought both the buffalo check blanket and the Be Merry pillow from the Scheel’s Gift Lodge, which is basically a winter wonderland! 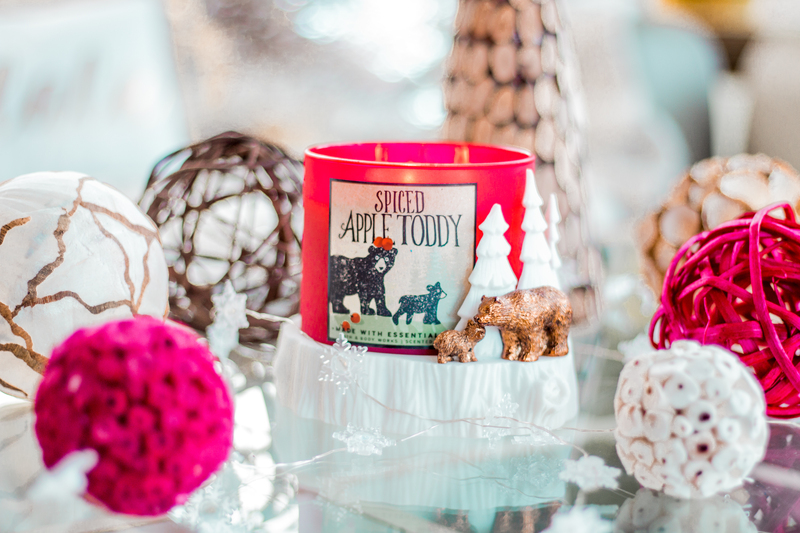 Have you shopped at the Gift Lodge? This was my first time and I was blown away by the variety of gift options they have! 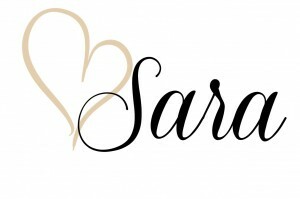 Thank you to my friends at Village Pointe for sponsoring today’s post! As always, all thoughts and opinions are sincerely my own! What a great list! I found myself agreeing with everything as I scrolled down. I think candles and pj sets are great gifts, and you can’t go wrong with makeup 😉 loved this post!